I scrapped this photo once before (back in 2000) and the layout is in Tucker's first year scrapbook, but I've always wanted to go back and scrap it again so that some day when I hand the kid's scrapbooks over to them, I'll still have my own copy to keep. The Glitz Designs wood grain paper and cute die-cuts are part of the February "Days of the Week" kit from the Paper Bakery along with the custom flair badges. That fun circle background is from the Silhouette store. I may or may not be addicted to cut files. Well, thanks for stopping by today, I appreciate the visit! very nice love the layout and what a wonderful time.. I love the splash of color that heart gives. Lovely page!! Love that circle background!! I wanted to say congratulations! ... on a beautiful layout. You actually went back and scrapped something that you meant to do, which I never do. This is fabulous! Love that circle graphic against the wood grain. 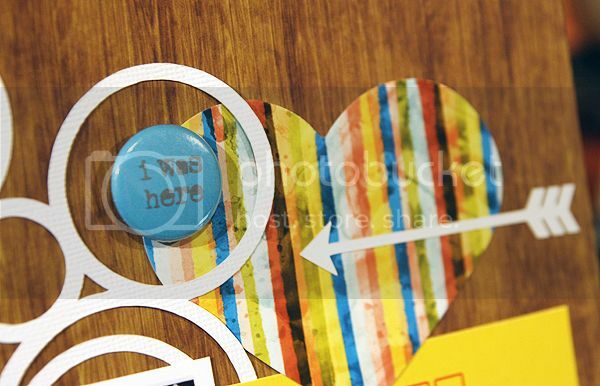 Love the brights of Color Me Happy with the woodgrain...and the I Was Here flair goes so well with the ultrasound pic...love it, Mary Ann! This is GORGEOUS!! So inspiring! Beautiful page - LOVING the circles! Beautiful! Gorgeous Mary Ann!! Love the Silhouette circles against the wood grain background!! I love "I was here" on the heart. Perfect! Really sweet! OOh I like this one! Thanks for linking up and sharing last week on Made in a Day!